I'm back today with another creation for The Cutting Cafe! 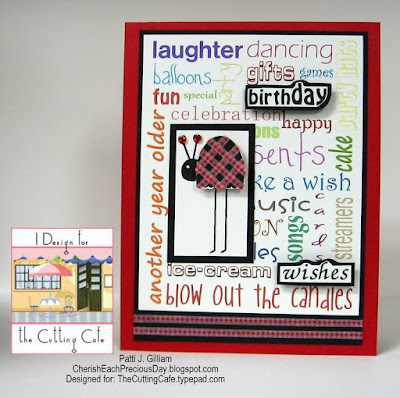 I hope you will pop over and look at all of the wonderful things Regina Easter has in the store, then, hop on over to the Cutting Cafe Blog tomorrow where you will see all of the Design Team's inspiration. Leave a comment for a chance to win! This week, we were to use some fun Silhouette images. I actually made two cards. Here is a card that I created, using the Fun with Silhouettes set. The sentiment was computer generated, and the image printed directly above the sentiment. It's difficult to see, but there are blue gemstones on each of the hearts on the tree, and the birds are painted with Glossy Accents. Final embellishment was a blue bow on the tree trunk. This next card uses a background, made with the Birthday Word Block. I chose to work with the darling ladybug. As you can see more clearly in the photo below, I printed the image twice. The second image was fussy cut, just around the ladybug's body. I then took the Washi Tape that I used on the bottom of the card, and crossed it over the ladybug's body. An eye was added with a white gel pen, and two teensy heart gems were adhered to the antennae. The finishing touch was to print the background in black and white, and pop up the 'birthday wishes' to stand out a bit. These are gorgeous! I loveeeeeeeeee them!!!!!!!!!!!! Wonderful card designs. I love them both. Love these Patti! So much fun! Whee - what fun is this second card - love it and you know the first one has that "appeal" that I love. Great job on both cards. Oh, Patti, these are both wonderful, and I love seeing them! They make me smile! One of these days, I need to spend a day looking through your blog and checking out some of the items from The Cutting Cafe! They have so many wonderful files, and you use them so well! I love digital images, but I am still quite the novice with my Silhouette. So I need more time perhaps this fall? Hehe! Hugs, sweet friend! An adorable, sweet and pretty cards! Love the colours, thanks for the inspiration! Two fun cards. 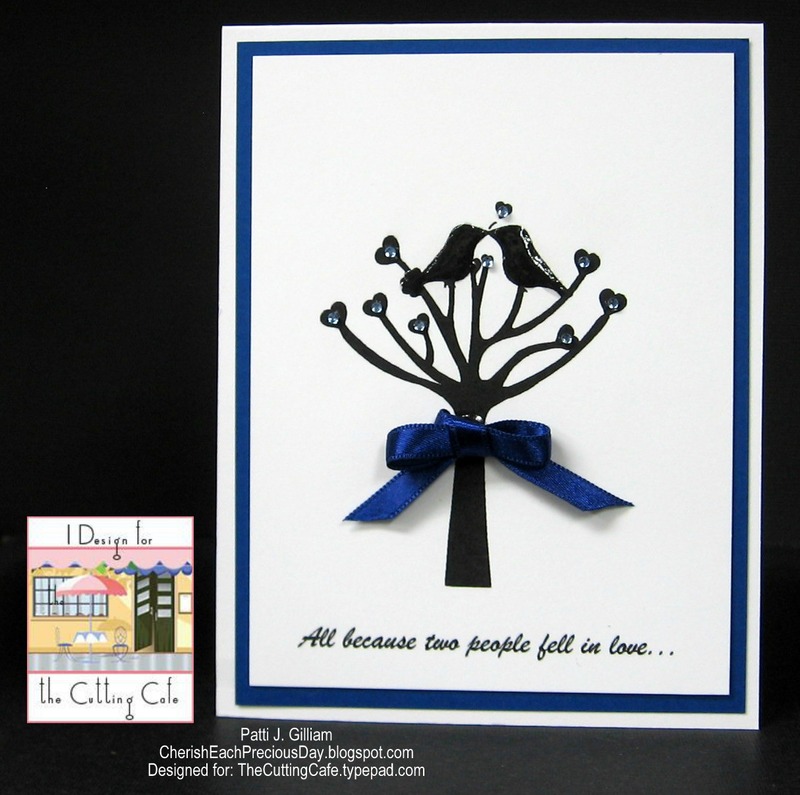 Love the tree and little birds. Sentiment is perfect too. to match your card background paper too. Fun cards both, Patti. Two beautiful cards. The first one is perfect for an anniversary or wedding, and that ladybug is just too darn cute for words. You are so versatile and come up with such a wide variety of work. Bravo my friend. Awww your little kissing birdies are so sweet!